I know. I know. I’ve been really slacking lately on the Family Focus Fridays. The honest truth? I’ve been tired. Like really tired. Coming home from a press trip (no sleep) and right into the first week of school (no sleep), you can guess what that adds up to. (And if you say a cranky, evil and disgruntled blogger….well, you’d probably be right). Focused on a BIG school year for my boy, I had a few lessons to learn. Insert foot in mouth as I share What I Learned During the First Week of First Grade. Ok, so I’m like 11 days too late and $15 too short for this post. But since this blog documents my own personal parenting journey as well as my family’s journey, I felt it was important to note that A) I’m not a perfect parent and B) I have so much more to learn. In fact, I think I ended up learning so much more than my son the first week. Deep breaths…and cue confession reel. Dude. A morning person I am not…nor will I ever be. An early morning for the boy means an extra early morning for me….or late night…or a combo of both. Where’s my coffee? I took a good hit to the face this week. Unfortunately, my son did not get the “sunny morning” gene from daddy. He takes EXACTLY after me with morning wake ups. I’ve been punched, kicked, yelled at and ignored as he clenches his covers in adamant retaliation. And despite last year being so difficult, this year…he’s bigger. Reminds me that I need to buy some sports protection equipment. You’d think traveling only a few hundred feet from our house would be a breeze. Add a half awake grump toddler…it’s like pulling an elephant. I have to prepare for Jekyll or Hyde every morning. If it wasn’t for our Easy Turn Coupe, I’d be having a kicking and screaming toddler at the bus stop. We changed bus stops this year. Now it’s closer with a bus driver that knows each child and has had the same route for years. While all comforting, I still hold my breath when he steps onto the bus. The Scariest 45 Minutes of My Life still replays in my head. Not sure that I’ll ever get over the fear of buses. You’d think being a seasoned school mom would stop the waterworks from flowing. WRONG. As soon as the bus turned the corner, I was DONE. Oh First Grade, you “slay” me (I guess that’s what the cool kids are saying these days). 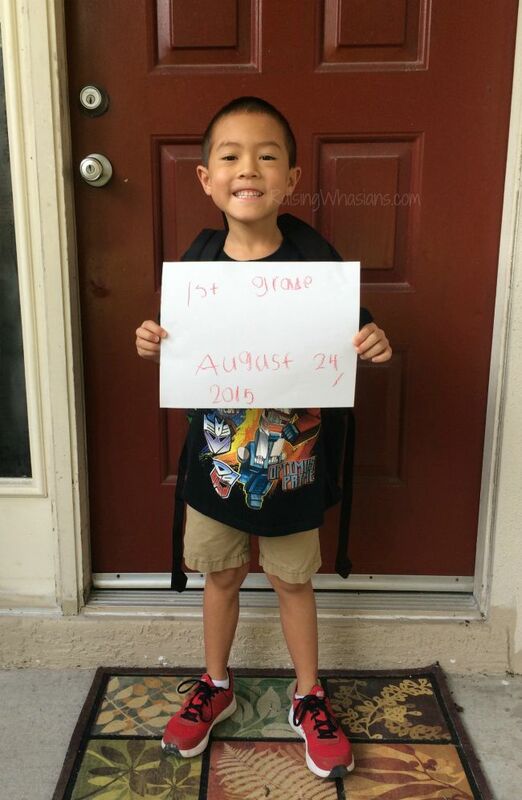 So lessons learned, First Grade is already shaping up to be a big learning year…..for mom. We have already bypassed week 2 of first grade. Pretty soon it will be a month, a year. Slow down, time. Slow down! What did you learn during the first week of school? Be sure to follow Raising Whasians via Facebook, Twitter, Google, Instagram, Pinterest and YouTube for our family moments, recipes, crafts and more. Thank you for sharing. It sounds like we’ve had similar experiences. 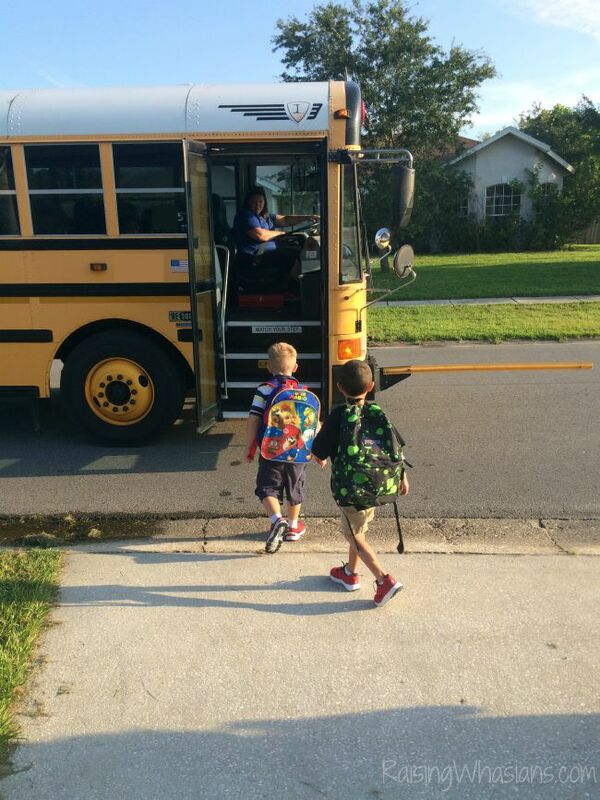 I think the beginning of the school year is harder for moms than kids. Hang in there! It will probably get easier as the year goes on. Starting up the routine of school after summer vacation is always hectic and sad. My son is just a baby now but this was a nice read. I’m not a morning person so I’m not looking forward to having to get him up and to school! Thanks for taking the time to read, Kristina! Getting back into a routine is always hard for both the parents and the kiddos. It is such a fun, but hectic time of year! Definitely fun too! Thanks, Maralea! I am a morning person and it atill is not easy! I have a daughter in 4th and she is super independent getting herself breakfast and ready. My son who is also in 1st grade this year is a totally different story! I really have to be on him about getting ready or we would never make it on time! And you wouldn’t have it any other way! I take my grandkids to school and I learned that it always takes longer than you think for them to get ready and even when they are ready, it can be challenging get out the door with everything. I couldn’t imagine with more than 2 kids! Aw poor mama!! Thanks for sharing your back to school experience with us! Although we are homeschooling, we try to keep as normal of schedule as possible. My oldest started First grade this year as well! I know exactly what you mean about the hearing issues lol, it must be a First grader thing! Glad I’m not alone, Lauryn! Gosh, I’m learning first grade is hard work! We’re studying for a Science test and I’m stressing. Thankfully, my first grader is pretty confident. Thanks for sharing all you learned! This is definitely helpful for moms in the same boat. It is so hard when you seem to be invisible to kids all the sudden. I hope your year goes well. 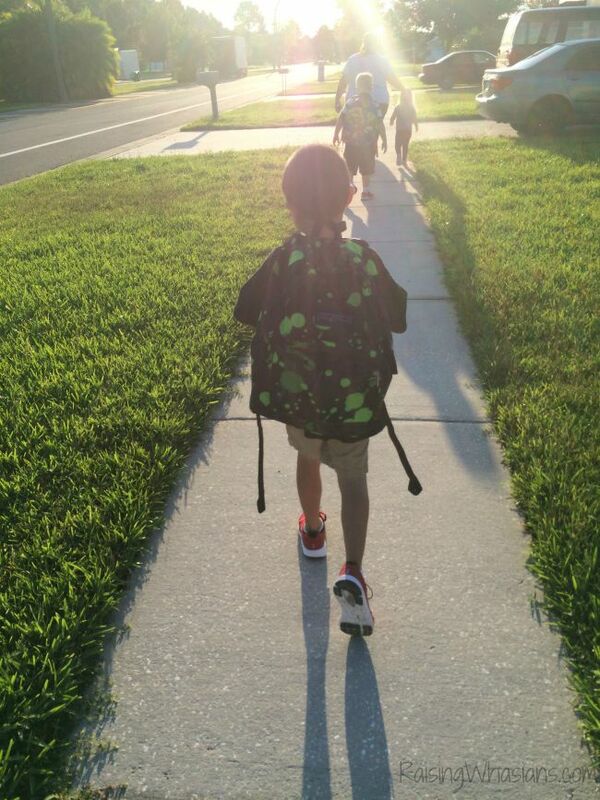 Our first week isn’t over until tomorrow but I’ve learned what it’s like for my kids to love school again. They love it and waking up they want to go as soon as they open their eyes. I can’t get my son up for preschool and that starts at 9am! I really need to get him (and us!) on a better schedule!